I got a call last week that Naomi got accepted into the Montessori school that's part of a local public school system. I was surprised because I believe she was 17th on the wait-list and they had told me they probably wouldn't know anything for sure until mid-August. Why is this so significant? Simply put...IT'S FREE FREE FREE! Of course, I only figured this out after going there, doing all the enrollment paperwork, coming home and thinking aloud to Henry that they hadn't given me any forms to fill out with reference to how we were going to be paying for it. Upon a very close review of the parent handbook I finally figured out that you only have to pay if you send them to the pre-school there. DUR! My lame-brain strikes again! What we learned from this photo "session"...it is very difficult to get a chihuahua to hold still for longer then about 2.4 seconds...if even that. UPDATE: Oh yeah, that's officially Henry's worst haircut ever. The lady might as well just shaved him bald. Ten-years we've been married and I never knew his head was kinda pointy...I don't think he did either. Here's the video of Naomi's recital this year. It's a Jazz routine to "Surfin' USA." Enjoy! Naomi's Dance Recital 2009 from Dayna on Vimeo. Naomi's Annoying Singing Take 1 from Dayna on Vimeo. Naomi's Annoying Singing Take 2 from Dayna on Vimeo. Naomi's Annoying Singing Take 3 from Dayna on Vimeo. Swap Meet Scandal, originally uploaded by gotanyrice. 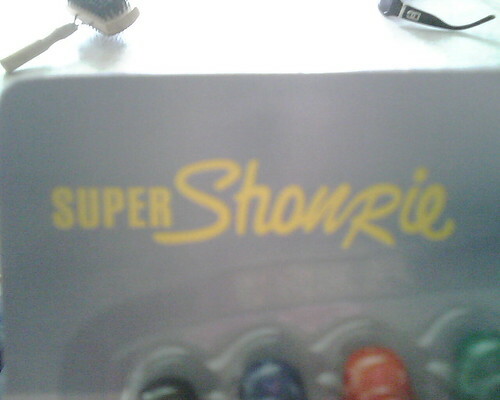 My friend Jin Ah thought she was getting an awesome deal on some Sharpies. Alas, they were Shanries. 1. She named all the caterpillars attached to the back of our house. They are Alana, Alphabet, Dee, Henry and one more I can't remember. 2. She finally named her Cabbage Patch Kid after having it for several years. Her name is Chelsea Scott. I clarified with her that Scott is not her middle name but it is in fact her last name. Naomi has two imaginary friends. One is named Jonathan, he is one of the rats from the movie "The Secret of Nimh." The other one is...Spiderman. I don't know what to tell you other then she has a very lively imagination. The other day I was in the bathroom and I kept hearing her say in this very nagging, wifey voice, "Ugh! Just pay the bills." She said it several times and since Henry wasn't home to be nagged at I asked her who she was talking to. She said she was talking to Spiderman. She said he needed to pay the bills and that she couldn't believe they were alreay fighting because they just got married yesterday. I was as shocked by it all as you are right now reading this.